Taylor during her bout with Victoria Bustos in Brooklyn last month. 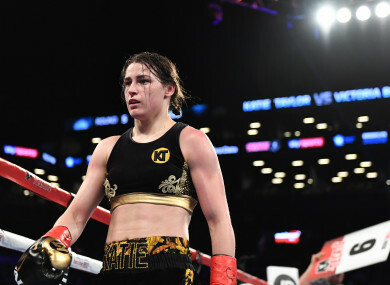 REIGNING WBA AND IBF lightweight boxing champion Katie Taylor has this evening moved to distance herself from the shooting which took place at Bray Boxing Club on Tuesday morning. Taylor’s father, Pete, was one of two men injured in the attack which claimed the life of 50-year-old Bobby Messett. A native of Bray, Taylor trained out of her local boxing club for many years as she rose to fame as a world class fighter, but having turned professional the 31-year-old was training in the US when this week’s attack occurred. The five-time amateur world champion expressed her sympathy to the Messett family and also asked that, having been ‘somewhat estranged’ from her father and former trainer in recent years, her other family members are kept out of the story. “I would like to wish my most heartfelt condolences to the family of Bobby Messett for their tragic loss,” Taylor writes in a statement to the Irish Times. “I can’t imagine the despair or the sense of injustice they must be dealing with. I’m praying they know God’s comfort in the hard days ahead. For my Dad, I’m very thankful and relieved he made it through this horrific attack and is recovering well. I understand there is still a lot of uncertainty about the nature of the incident but I’m hoping the gardaí will get to the bottom of it very soon. Email “Katie Taylor 'appalled' at use of her name and image in reporting around Bray shooting”. Feedback on “Katie Taylor 'appalled' at use of her name and image in reporting around Bray shooting”.